These Hi-Vis Traffic Control Gloves from Ringers are designed for traffic or crowd control operations, or for anyone who wants to make sure that they show up in the dark. 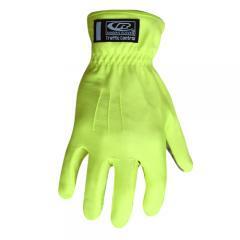 They are made from reflective fabric in a bright chartreuse color, making them almost impossible to miss at night. Reflective strips on the palms provide even greater visibility and ensure that bystanders can see your hands, making it easy to signal to other people. The gloves come in a pull-on design that makes them easy to put on and take off, and the lightweight fabric is flexible and comfortable to wear. The customer service was excellent and the quality of the gloves also great, the shipping was quick and right on time. I will shop again with CopsPlus.